Video: West District Superintendent Rev. Mark Nakagawa delivering remarks describing the valiant work of The United Methodist Church already underway in the Los Angeles area. Full transcript below. 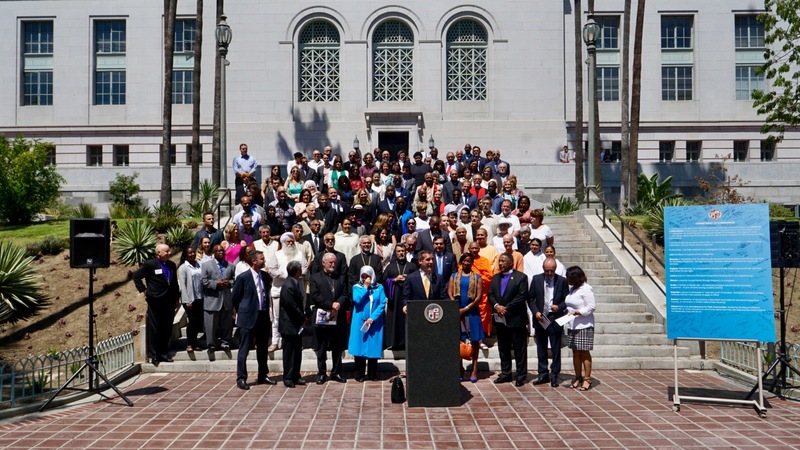 On Thursday, July 20, 2017, leaders from the California-Pacific Conference joined over 100 clergypersons in supporting the Los Angeles City Mayor Eric Garcetti’s “Days of Compassion” effort to end homelessness. Learn more and join the Days of Compassion 2017 via the button below. “We in the United Methodist Church are excited to formally partner with the City of Los Angeles in a pilot program that is responding to the homelessness crisis that confronts all of us. As was broadcasted on a local NPR segment Tuesday evening, one of our congregations in South L.A. launched the Safe Parking program a month ago. 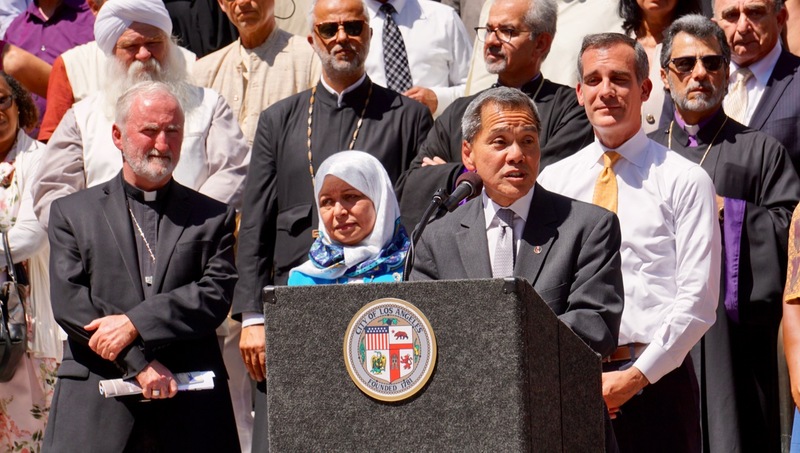 It is a partnership between the congregation, the Mayor’s office and the City, with valuable support and assistance from the Homeless Outreach Program and Integrated Care System, a.k.a HOPICS, and the Los Angeles Homeless Services Authority, a.k.a LAHSA. Through Safe Parking, individuals and families who are forced to sleep in their vehicles at night are now able to do so in a secure, safe environment instead of on a dark, unsafe street. As a church bureaucrat, I’m excited to see that the congregation has turned this program into a ministry. Each morning, the program clients can take showers in the church’s social services center, with all shower supplies provided for them. Additionally, the church’s staff and congregants also provide a sack lunch for each adult and child when they depart for the day. There are currently six vehicles that park in the lot from 9:00 pm each night to 7:00 am the following morning, seven days a week, with more potential clients responding to the program as information about it becomes available. It’s important to note that The Safe Parking Program is not an end, but a means to an end. It’s the first step in getting people off the street and into permanent supportive housing. The journey from sleeping in one’s vehicle to a permanent home is a long one, and the next steps are still being formulated. What’s important is that Safe Parking now provides vulnerable, homeless persons and families that important first step. Finally, let me also say that while we wished homelessness was not the reality that it is here in Los Angeles, it has given this one congregation a valuable opportunity to live out the ‘social holiness’ that is embedded in United Methodist Christian faith. John Wesley, the patron saint of the Methodist movement that began during Industrial Revolution-era England, believed that one’s faith wasn’t just a vertical relationship between the individual and God, but also a horizontal one that extends outward to all of God’s children. Through Safe Parking, a mundane church parking lot has taken on a holy purpose, which is to bring hope and transformation into people’s lives.